1. Keep head forward & eyes on the horizon. Your head follows your eyes so if you are watching your feet then you head and neck are tilted down. This creates neck tension and poor form. 2. Have relaxed shoulders. If your shoulders are creeping up toward your ears remind yourself to push your shoulders down and back. 3. Hands should be loose and not clenched. This keeps arms, neck, shoulders and face muscles relaxed. Make sure arms swing next to the body and not across it. 4. Activate your core by pulling your belly button to your spine. This action activates the core muscles to engage and support your torso and keep hips aligned. 5. Make sure your knee is in line with your big toe. If your knee rolls inward or outward it creates stress on ligaments, tendons, joints, muscles and bones. 6. 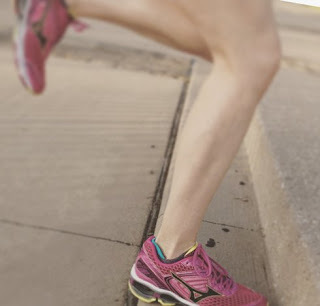 Focus landing on midfoot and avoid striking on your heel or toes. This helps the loading force to be distributed on the correct place on the feet. 7. Swing your leg back and other leg drives through the knee. Imagine you are using your hips to drive the force through the knee down to your foot. 8. Watch your stride. Be cautious of overstriding. That can lead to injuries. Keep a comfortable stride. 9. Pick up your feet when you are tired. One of the first mechanics to breakdown due to fatigue is picking up your feet. If you find your feet are stumbling or not lifting very high when clearing the ground take a walk or rest break. A break is better than a fall. Excellent tips for running form! Great blog and posts!